2.5 Troll Bridge News - Get your Pre-order in NOW! A new paperback edition of Only You Can Save Mankind came out this week, Good Omens has almost wrapped up filming, there seemed to be at least 5 different productions on at various places around the world, and little pockets of Discworld fans met up all over the UK for various reasons. And we got name checked in an article by Tor.com. (see if you can spot us at tor.com) What more do we need to tell you in an editorial? We have several places where you can get up to the minute news and information about all things Discworld from Discworld Monthly. And our website, discworldmonthly.co.uk which contains loads of information about the books, stage productions around the world, interesting articles, back issues and our merchandise shop. Want to make your opinions about the Discworld known to the world? Been to see a play or a Discworld related event and want to write a review about it? If you are putting on a stage production or know of a stage production near you, please email us and let us know about it. We happily advertise all stage productions for free and we can help in other ways too. Email with the Subject line "Stage Production". The deadline for submissions to issue 252 of Discworld Monthly is Wednesday 21st March 2018. This month we are a few days late getting the newsletter sent out, but we have a good reason. After 250 issues, we have upgraded the email newsletter to use HTML format instead of the old plain text. Actually we send both versions in the email if you feel nostalgic and your email software allows it. We are now nice and shiney in your inbox as well as on the website! It meant a few changes to our conversion programmes (we write this in Google docs and then have to convert it to the differing formats for ebooks, website and email) and testing it a few times to make sure it worked as intended before we sent it out to you, our wonderful readers. We hope you like the change and would love to hear your thoughts on our new look. Good Omens has been filming in South Africa and will be on their last couple of days until the series filming is all wrapped up. A few new faces have been added to the cast including Mark Gatiss and Steve Pemberton. It seems such a long time ago when we were first told that a TV series of Good Omens was finally going to happen, but in reality it was only 2 years ago at Terry's memorial in 2016 at The Barbican. We have seen so many images come out from the filming over the last few months via Neil Gaiman's twitter feed, and from what we have seen, it looks amazing. We really can't wait until 2019 to see the end result! The Amazing Maurice has had its new cover revealed. The cover illustration by Laura Ellis Anderson matches in with the Tiffany Aching series that was re-issued last year. We love Laura's vision our second favourite cat. Let us know what you think! The latest issue of SFX with "The Book Issue" emblazoned on the cover, features interviews with several authors. One of them, Patrick Ness (page 61) says that his Desert Island book would be The Discworld Series by Terry Pratchett. The rest of the magazine features an eclectic mix of science fiction, tv, film and book news. Troll bridge's contract states that they can continue raising money while they are still in a position to spend money. Once the film has been completed and outstanding expenses covered, SnowGum Films may need to close off DVD availability. So if you want it on DVD or Blu-ray, pre-order it now as you may not be able to get it later! As we stated last month, there will be a charity auction at the 2018 Discworld Convention in Chesford Grange. They are literally begging for AMAZING items to auction off for charity. So if you have something that you think other Discworld fans will want, email the team at with full details and a photograph of your item. The closing date for registration is 20th April 2018. This is to allow the auction team time to produce a catalogue for all you prospective buyers out there. The auction team will make a decision about your item and if it is accepted they will send you an email with instructions for getting your item to the auction. The auction will have approximately 60 lots. The team require all items to be pre-registered so they may keep the auction varied with items for every pocket. Unfortunately, this does mean that they may have to turn down some offered items. Q1. When Olly the Snake played a trick with the road sign where was Mr Bunnsy redirected towards? Q3. What does the first rat get? Q4. What does the second rat get? Q5. As resident rat piper what special allowance did Keith ask for? The answers as always appear at the end of this issue. We headed to the closing night of the run with our friends in tow to the Progress Theatre. The theatre is very intimate seating less than 100 people. The stage was wonderfully set up so that it was effectively six separate spaces despite the fact it was smaller than your average front room. It had a Main stage area at the front with 5 smaller very versatile areas to the rear of the stage. I want to congratulate the crew who built the set as it was a beauty to behold. It made scene changes part of the opera with its ability to create whole new areas in split seconds. It allowed the production to seamlessly move the cast around the various locations. Maskerade is a parody of The Phantom of the Opera and the company had gone all out to make you feel like you were in an opera house. The flickering candles (led ones I might add) around the seating area were a stroke of genius and the ever present chandelier was a sight to behold swinging ominously above the stage. I am now going to say something I never thought I would say. We met a real Nanny Ogg at the Progress Theatre. Her presence on the stage set every scene she was in on fire. I doubt Terry ever met Liz Carroll in real life but she embodied the very essence of the type of woman Nanny was based on. Agnes was perfect, the condescending looks she threw at Christine were a masterclass in concealed eye rolling. Christine was as annoying as a wannabe should be (Shrill, highly strung and deluded). Walter had the downtrodden version of himself with comedic falls nailed. Detritius' arms alone had me giggling beyond all known reason. The remainder of the cast had obviously read the books and understood their characters well, credit to the director for making sure they did. No one put a foot wrong and they were all enjoying performing and it showed. On Saturday 17th February myself and a few others (Colin, Paul, Nick) attended a matinee performance of Men at Arms in Cranbourne, put on by their dramatics group. The venue was a church hall which on first appearances didn't look big enough to hold a production but like the tardis was bigger on the inside. The whole performance was exceptionally well done and very enjoyable. The characters though not how I had imagined them, had the essence of the character perfectly portrayed by each actor. I was amused by the number of different uses a box could have on stage and watching the scene changes became a guess the use for the box which I didn't always get right (played in my head not out loud in case you were wondering). Samuel Vimes was played as the surly no nonsense man of the law he is portrayed as in the book. Lady Sybil Ramkin was as forthright, no nonsense and aristocratic as in the book. Nobby Nobbs was as much a of a street urchin trying to fit in with 'normal' society as I envisaged him. Detritus and Cuddy were a perfect matched pair of friends that don't see eye to eye on everything. Fred Colon was as gruff, weathered and partner in crime to Nobby as envisaged. Havelock Vetinari for me was not quite on the mark but was played well nonetheless. Carrot Ironfoundersson was well played and his interactions with Angua were wonderfully done and almost off the page from the book. The visualisation of the footnotes was both unusual and a bit annoying at times but didn't fully distract from the main action on the stage. The lesser characters were also well done with some of the actors doing multiple parts. The stage scenery was kept to a minimum but that didn't detract anything from the production if anything it kept you focused on the actors and not the background. For a group that doesn't normally do this genre they did a fantastic production and I hope they do more from the discworld in the future. All in all I enjoyed what was my first performance of a Discworld book and hope to see many more in the future. This month we have a copy of Only You Can Save Mankind with the new Mark Beech cover to give away. Q1. What are the names of the other two books in the series? Send your answer and your full postal address to by Wednesday 21st March 2018. Your address will only be used for sending out your prize should you be the lucky winner. Once prizes are sent out all address details will be destroyed. Entries received after the closing date or sent to any other address will be ignored. No more than one entry per person will be accepted - multiple entries will result in a ban from the competition. Failure to answer the questions or provide your postal address will prevent you from being entered into the competition. Answers to the questions must not be posted to any websites before the competition ends. The judges' decision is final. The competition is open to all readers. Last month's competition had a wonderful prize package which included: a reading journal and a copy of Behind the Sofa - Celebrity memories of Doctor Who featuring a foreword by Terry. Q1. What hat is Terry wearing in the infamous picture of him trying to get into a Tardis? The answer we were looking for was a top hat. The randomly selected winner of the competition is: Janet Empson from Ashby, Scunthorpe. We'll get your prize in the post as soon as possible. We assume any correspondence is eligible for use in the newsletter unless otherwise stated, including the sender's email address. We may edit your letters using a 1934 Victory H. It is vitally important that you don't pass off other people's work as your own. If you use information from other resources please let us know so we can give proper credit. We love repeat interaction from our readers. We got this email this month. First up, congrats on the 250th issue of Discworld Monthly! So, I finally got my hands on the 2008 Yearbook! But, no dice. The monk on December 6h indeed looks rather surprised but that's not the one I was looking for. Seeing as I couldn't find it in Paul Kidby's Discworld Imaginarium either, I thought I'll just repeat my plea for help. So, I'm still looking for a picture of Wen the Eternally Surprised from Thief of Time. I think it was done in pencil and if it wasn't done by Paul Kidby it was certainly done in his kind of style. Any pointers to books, almanacs or calendars would be greatly appreciated! Maybe you can help me out. I faintly remember having once seen a picture of Wen the eternally surprised which cracked me up no end. I think it may have been in an almanach or a calendar or something, but I can't be sure. It was done in pencil, I think and I'm kind of sure it was done by Paul Kidby. But for the life of me I can't find this picture on the internet. Maybe you know the one I'm talking about? If you happen to know which book or calendar to find this in I'd be very grateful if you could point me there. I'm sure I could then find it on ebay or amazon. Jason wrote: Hi Thomas, I don't remember the image you are talking about. Wen is mentioned in two places The Thief Of Time and Lu-Tze's Yearbook of Enlightenment 2008. Thief of Time was pre Paul Kidby doing Discworld covers. Not sure any of that helps? 1. Love to see this coming in. 2. Thank you both for your devotion and commitment! * From "David J Gay"
With reference to Ian Jopson's enquiry (last month), could it be that he is thinking of Hodgesaargh reading the huge ledger entitled "Burds" in Carpe Jugulum? In the edition which I have, the passage can be found on page 99. Thank you so much for your guided tour of the Salisbury exhibit. For those of us who could never get there, it was a lively recreation. Bless you. I've been reading DWM for a while now but this is my first time writing in. What's The Librarian's favourite song? Don't Ook Back In Anger! Thanks for the great work in the newsletter. Could anyone please tell me how i can obtain a complete list with dates of all of Terry Pratchett's Short stories, including Bucks free press etc. Thanks, Jason and everyone else. Awesome Discworld Monthly Just in awe. Back in 1997, I was an American expat living in Hong Kong. I had never heard of Terry Pratchett, but found his books at a local English bookstore. I was hooked with the first reading, and soon so was my 12-year-old son. We wanted more information about Discworld and soon found a copy of the first Discworld Monthly in the hands of a new English friend. We read it with relish and continue to enjoy it to this day. Here in the US, we moved to a small city without access to Terry Pratchett books. Thank goodness for the internet and Amazon. We have an extensive collection of the Discworld books and hope to someday make the trip "across the pond" to some of the events held there. Keep up the tremendously terrific publication! We'll keep reading! Only You Can Save Mankind was published on the 22nd February 2018 by Corgi in the UK and will be published in the USA and Canada on the 25th September. The Discworld Imaginarium standard edition will be available to buy in the USA and Canada from the 24th April 2018. The Amazing Maurice and His Educated Rodents will be re-released on the 26th April 2018 by Corgi in the UK. The Slipcased deluxe version of Father Christmases Fake Beard and other stories will be available in the USA and Canada from the 25th September 2018. Coup de Tabac is due out on the 8th Feb 2018, Published by Pocket its has 528 pages. Chapeau de Ciel is due out on the 21st June 2018, published by l'Atalante. Regiment Monstrueux is due out on the 21st June 2018 Published by L'Atalante. Ronde de Nuit is another one due out on the 21st June 2018 published by l'Atalante. Der Lange Mars will be published on the 19th March 2018 in paperback by Goldmann Verleg . Ein gutes Omen in paperback will be published on the 2nd May 2018 by Piper with the glorious Josh Kirby artwork on the cover. Whilst we would love to get to every event and play to write reviews and articles about them, we just don't have enough time, petrol and a wide enough spread of friends to borrow the couch for the night. But you, our wonderful readers do have the time, petrol and often don't need the couches as the event or play is on your doorstep! We don't have English degrees here and you don't need one either to write something for Discworld Monthly! PS. If you know of a play or event that we don't know about (shock horror), email us. We like the surprise! Don't forget to visit Pratchett Stage Productions for our most up-to-date list of stage productions. [UK] We are Theatre presents Maskerade as adapted by Stephen Briggs. [USA] GreenMan Theatre Troupe presents Monstrous Regiment as adapted by Chris Hainsworth. [UPDATED, UK] Tilt Theatre - City College Plymouth Performing Arts presents Guards! Guards! These Stage Productions are at least a few months away on the calendar, but if you have a pair of the trousers of time you may be able to slide into the future and bring back a review for us now! If you don't have access to either then you should be able to purchase tickets and travel forward in time the old fashioned way - one day at a time. Join in a celebration of life on Sir Terry Pratchett's Birthday (28 April) by honoring his legacy and experiencing his Discworld. Discover the streets of Ankh-Morpork, the greatest city of the Discworld. A folklorique network of old lanes, squares and alleys for your walking pleasure. Where excitement and trolls lurks around every corner and much may be heard the traditional street cries of old time also the laughing visages of the denizens as they go about their business private. Dogs and unruly luggages to be kept on leashes at all times. Please note - there is a 1km dirt road to the venue but it is suitable for most cars. - An Ankh-Morpork Adventure: Seek! Hustle! Build! Conjur! Enter as a single person or with a team of wizzards, complete the tasks as laid out for you by the Patrician. - Fabricati diem, pvnc: test your mettle and train with the City Watch, they are recruiting! - The presence of beer always greases the rungs of the evolutionary ladder so make sure your Inn-sewer-ants-polly-seas are up to date and join us in The Mended Drum. Expect a test of wits, much revelry and many barbarians. - The Discworld Dress Up. Embody your favourite character and be victorious. Win Thynngs. - Burnt crunchy bits, dwarf bread, rat onna stick and other local delicacies can be found between Harga's House of Ribs and the Curry Gardens, so weary travellers and brave explorers will not have holes in their tummies. Keep an eye out for Cut-me-own-Throat Dibbler. All guilds are welcome, so if you fancy yourself as an artificer, a seamstress, an assassin or a clown, you'll be sure to be in good company along The Street of Cunning Artificers. The location and date of 2018 Discworld Convention in the UK has been announced. It will be at the Chesford Grange Hotel on the weekend of 3rd - 6th August 2018. Memberships have been released and have SOLD OUT. Don't fret though, ConCom are now operating a waiting list for those who wish to have a chance of attending. CABBAGECON 5 - Be a Barbarian hero ! Tickets: Weekend - Adult 65 Euros Child 35 Euros Student 50 Euros. Single day tickets are available on their website. Will be held from the 12th to 14th April 2019 and is authorised by Ankh Morpork Post Office. Scheibenwelt Convention have announced that the next German Discworld Convention will take place from the 3rd to the 6th of October 2019 at Castle Ludwigstein. The theme will be Hogswatch. Tickets are not on sale as yet but do visit their website to find out more information . [IDWCon] The Irish committee has confirmed that the next Irish Discworld Convention will happen in 2019! More info will come soonish. It's happening in 2019. That's all we know. We'll update this when we get more news. The Drummers are now holding irregular weekend meet-ups in addition to their regular Mondays. Dates are posted on their Facebook page and sent out via their mailing list. [Adelaide, Australia] The City of Small Gods is a group for fans in Adelaide and South Australia. [Perth, Australia] The Treacle Mining Corporation meetup to celebrate the works of Sir Terry Pratchett, and welcome any fans of science fiction and fantasy. [Sydney, Australia] Western Drummers (western suburbs of Sydney NSW Australia) meet 6pm on the third Tuesday of the month at the Nepean Rowing Club for dinner chat and games. Appreciate Discworld and Sir Terry Pratchett? Want to chat and gather with other Discworld fans in the US and Canada? Regional Discworld fan Facebook groups are linked below! If you are in a border state or a province between two groups, feel free to join both groups. [Australia] Drumknott's Irregulars is a newly established Terry Pratchett social group based in Canberra. The group is open to anyone and their events are not heavily themed. This month's issue is brought to you by the screams of a mandrake as it's being repotted. 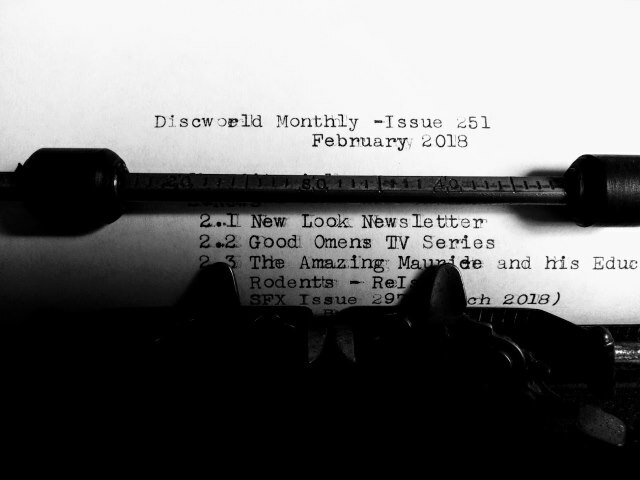 Please let us have any submissions for issue 252 of Discworld Monthly by Wednesday 21st March 2018. Since issue 166 we have produced a version of Discworld Monthly that is formatted better for the Amazon Kindle eBook reader and since issue 186 we also produce an ePub version for other eBook readers such as the Kobo, Nook and Sony readers. 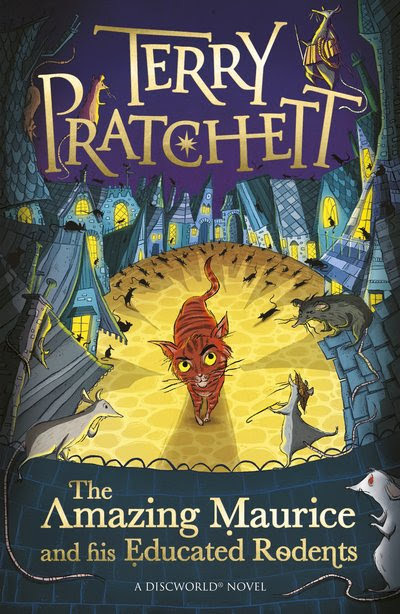 This Discworld Monthly website a list of books on our website with the cover blurb and direct links to UK, US and Canadian Amazon websites. A1. He was heading into the Dark Wood. A2. Rats that have not changed. A3. The first rat gets the trap. A5. Keith asked for a pipe allowance. We make every effort we can to ensure the information in this newsletter is accurate and legal. All trademarks are recognized as the property of their respective owners, whoever they may be. Discworld (R) is a registered trade mark of the Estate of Sir Terry Pratchett used under licence. Whilst you keep reading it, we'll keep on writing it because we love Terry's books just as much as you do. Copyright © 2018 Discworld Monthly.